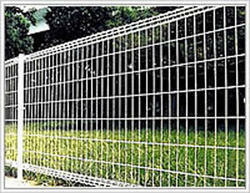 Exporter of a wide range of products which include farm fencing. We offer an exclusive gamut of Farm Fencing that is manufactured from the steel wire helically wound and continuous mesh without knots or ties except in form of knuckling or twisting. Farm Fencing is manufactured in G. I. Wire, PVC (vinyl) coated wire, from 1" to 4" mesh and from 16 gauge wire to 6 gauge wire. Looking for Farm Fencing ?